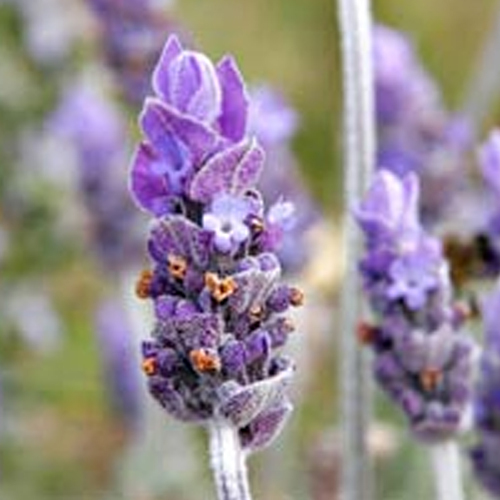 Kashmiri Lavender oil is used to treat a variety of health conditions. It is used for headaches, depression, nervousness, insomnia, exhaustion, rheumatism, in relieving muscle spasms, in stimulating blood flow, and as a cell regenerator. It supports the digestive and respiratory systems, and joint health, it reduces inflammation, fights infection, promotes skin healing and supports healthy tissue growth, it helps treat sunburns and sunstroke, it is used for the relief of asthmatic and bronchitic spasm, it helps to eliminate nits, it is used to treat head lice, it is used as an antiseptic and pain reliever, it is used for minor burns, insect bites and stings, it is used to prevent scarring and stretch marks, and to prevent wrinkles. This oil is colorless to pale yellow liquid with strong aroma. This essential oil has an excellent tranquilizing and calming effect on the nervous system. Traditionally, the flower of the plant was used in ayurvedic medicines as it is the best remedy for nausea. The oil is anti inflammatory and thus, helps to eliminate free radicals and infections. It is an overall tonic with excellent antibiotic qualities. Generally non-toxic and non-sensitizing. Use well diluted. Avoid use during pregnancy.